John Browning’s last sporting rifle design, his long recoil autoloader, proved to be by far the best-selling and most popular autoloading sporting rifle in the world, and was kept in the Remington catalog for nearly half a century. 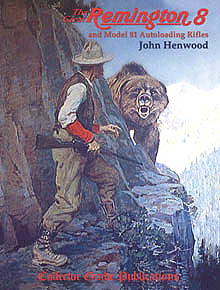 This first Collector Grade edition includes chapters on the genesis of the Remington Arms Company; Browning’s five long recoil patents; the history of the ModÃ¨le 1900, the nearly identical clone produced by FN in Belgium, and the use of Browning, Remington and Winchester autoloading rifles by the French Air Service during World War I; the “cosmetic revamping” of the Model 8 which resulted in the Model 81; in-depth histories of production changes, markings, shipping dates, codes, and costs; deluxe-grade (engraved) and special models (factory experimentals, military, police and F.B.I. variants); contemporary autoloaders from around the world; notes on collecting the 8 and 81; how the long recoil autoloader works; disassembly, troubleshooting, and Model 8 and 81 component interchangeability; ammunition, ballistics, and reloading; factory options and aftermarket accessories (charger clips, magazine conversions, iron sights, scopes and mounts). The last chapter, titled “The Legend”, is a fascinating study of Remington advertisements, posters and sporting art, which have become increasingly popular collectibles in recent times.